As you probably know, I come from a little state called New Jersey. Although small, New Jersey is full of strange things that always make me smile. There’s a whole magazine / website / book dedicated to these things and all three are known as Weird NJ. (I am not being paid to write this, and although I met the authors once, they have no idea who I am!) While I was living in NJ, I bought the magazine each time it was published and had a great time reading about all the local oddities. My favorite was seeing something on the pages that I already knew about! Today I am going to share some of my favorite Weird NJ places in hopes that you will enjoy them as much as I do. 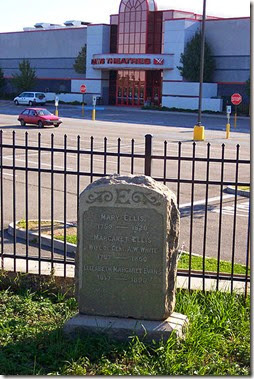 The first Weird NJ site I ever discovered was the gravesite of Mary Ellis, which is located in the parking lot of the Loew’s Movie Theater on Route 1 in New Brunswick (formerly the Route 1 Flea Market). I had gone to the movies and noticed a raised gravestone in the middle of the parking lot. Finding it funny and a little creepy, I was excited to find out more. “As the legend goes, Mary Ellis came to New Brunswick in the 1790’s to stay with her younger sister Margaret. It was around this time that she met and fell in love with a man who was a sea captain, and former Revolutionary War officer. The Captain sailed down the Raritan and out to sea one day, vowing that when he returned he and Mary would be wed. He even left her his beloved horse to look after in his absence. Every day after her captain’s departure, Mary would ride his horse from her sister’s house, on what is now Livingston Avenue, down to the banks of the river to eagerly await a glimpse of her lover’s returning ship. Mr. Searle, whose love of the sea and watercraft stems from his boyhood days near the docks in Elizabeth, N.J., and his time as a member of the United States merchant marine…had the boat towed up the Raritan to his marina near the lazy — and lazily christened — “No-Name Creek” and started dreaming: Could the Mary Murray become a restaurant, a floating ferry museum, a reef?” [source] However, he was never able to turn the ferry into anything but a landmark! Another strange NJ place was the town of Zarephath, located in Franklin Township, Somerset County NJ. This town was the headquarters of the Pillar of Fire Church, an organization known for religious frenzy. 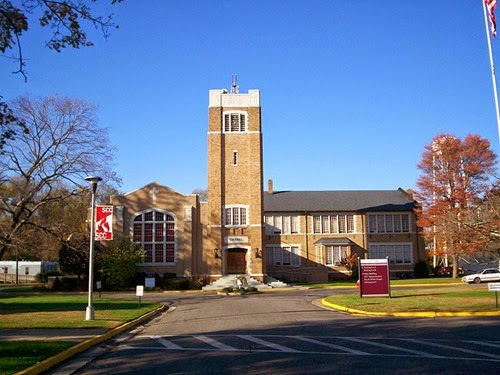 The founder, Alma White, was “noted for her association with the Ku Klux Klan, her feminism, anti-Catholicism, antisemitism, anti-pentecostalism, racism, and hostility to immigrants.” [source] The town of Zarephath existed as a home for education of missionaries, preachers, and teachers and had a population of 37 in 2010. I was so curious about this town that I did a paper on it during grad school! The entire campus has since been abandoned due to flooding from Hurricane Irene.